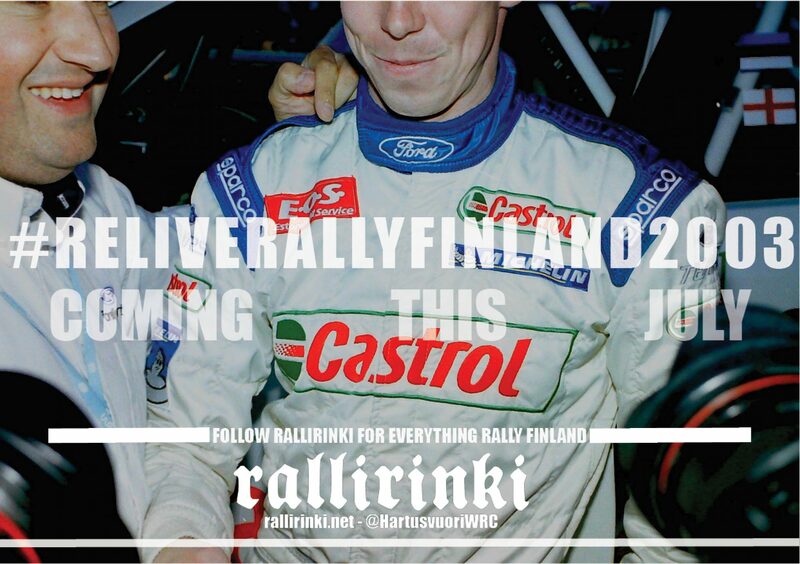 #ReliveRallyFinland2003 – RALLIRINKI brings Rally Finland 2003 back to life – and for the first time to Twitter! This year we have two Rally Finlands on Twitter. Rallirinki, a group of Finnish rallying fans, will bring back to life Rally Finland 2003, the classic edition of modern WRC events. From July 16th to 22nd Rallirinki will publish the story of Rally Finland 2003 as a historical re-enactment by live tweeting its events, news and observations through Rallirinki’s Twitter account @HartusvuoriWRC. To accompany the tweets, Rallirinki blog (rallirinki.net) supported by two guest bloggers will have daily posts with background articles and exclusive interviews about the event and its drivers, including Markko Märtin and Marcus Grönholm. Rally Finland 2003 live tweeting – using hashtag #ReliveRallyFinland2003 – will follow the timeline of the event held 15 years ago from Monday of the rally week all the way to the final news on Sunday. The story is mainly written from a first person’s view, that of a spectator that travels to Central Finland for the event and experiences it all the way through. The tweets follow preparations through recceing stages and reading all the news beforehand to following as much rallying action as possible when the event starts. For Rallirinki’s project, this is a natural choice for a point of view, because that kind of dedication is how we prepare and perform – and live tweet – from the current events as fans. Tweets are scheduled to be published on a right day and a right time, as if the event would happen again. The only artistic freedom taken is the publication week which is three weeks before the original dates, early August when Rally Finland 2003 actually took place. We wanted to publish this project before this year’s Rally Finland to lift up the atmosphere for this year’s edition. Times have changed in 15 years, but competition-wise there are a lot of similarities when comparing 2003 and 2018 events. Whereas 2003 event had several challengers for the victory and more for the podium, 2018 event has exactly the same situation. Looking back, you will learn 2003 was very good edition for Rally Finland. It’s not a spoiler saying Markko Märtin won the 2003 event. Thousands of Estonian rallying fans were celebrating in the Jyväskylä region. This year Ott Tänak is there in the mix to win Rally Finland, and with this project we’d like to welcome all Estonian fans on their country’s 100th anniversary to support their own hero in Rally Finland. Throughout seven days hundreds of tweets with hundreds of new photos will be published. Tweets are written and scheduled by Teemu Lampinen. The thorough background work took place earlier this year over four months and approximately 140 hours. Old magazines and newspapers were sought after, including visiting antiqvariats and placing bids on eBay. At times it felt like hunting to get those photos that were thought no one would have. A great help came from YLE and its Ralliradio team. Getting an access to the remaining recordings of 2003 Ralliradio broadcasts brought great depth to this project. Also, Rally Finland organizers and FIA helped a lot with collecting all the official documents of the event. This project also received help from several dedicated rallying fans, namely rallying photographer Vesa Rauhala, who gave access to his films from the event. A few other friend gave their photos for use. Our wish is that people following this project would share their own memories of the event and the times. Feel absolutely free to post your comments and photos along the way. We hope you will enjoy this project. Time machine is set now. Rally Finland 2003 is about to begin. #ReliveRallyFinland2003 project will launch on Monday July 16th and go live all the way to Sunday July 22nd. There are hundreds of tweets scheduled for publishing, including well over hundred previously unpublished photos. Guest blog articles will be published on It Gets Faster Now! (itgetsfasternow.wordpress.com) and WRC Wings (wrcwings.wordpress.com). Seuraava Seuraava artikkeli: #ReliveRallyFinland2003 – Rallirinki palauttaa 15 vuoden takaisen Suomen MM-rallin eloon – ja ensimmäistä kertaa Twitteriin!